The effects of screen time on sleep are well-known, as blue light emitted from our televisions, phones, tablets and computer screens can disrupt our circadian rhythm. But what we didn’t know is exactly why this happens. Now, thanks to researchers from the Salk Institute, we may have figured it out. In fact, according to the study, published in the journal Cell Reports, the reason is simple: Certain cells in the eye process ambient light differently, and this can reset our internal clock. Of course, this is an oversimplified explanation. The details are much more specific, but to put it in layperson’s terms, the backs of our eyes contain a sensory membrane called the retina, inside which there is a layer of light-sensitive cells. When these cells are exposed to light, a protein called melanopsin is developed. If melanopsin regenerates for 10 minutes or more, melatonin levels drop accordingly, and since melatonin is directly responsible for regulating sleep, this drop causes individuals to be more alert and awake. 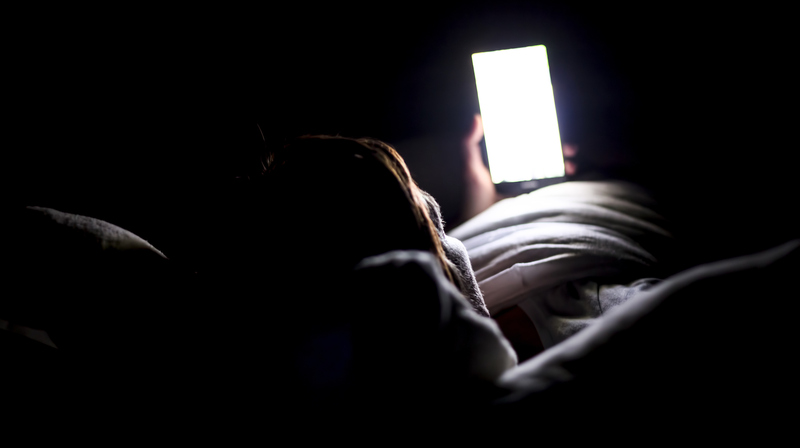 However, since “we are continuously exposed to artificial light, whether from screen time, spending the day indoors or staying awake late at night, this lifestyle causes disruptions to our circadian rhythms and has deleterious consequences on health,” Salk professor and senior author Satchin Panda said in the statement. The good news is Panda is hopeful this information will lead to further discoveries and/or treatments. In fact, he and fellow researchers want to find ways to influence melanopsin to reset internal clocks and help with insomnia. In the meantime, the best way to improve your quality of sleep is to reduce your exposure to light and (specifically) blue light.